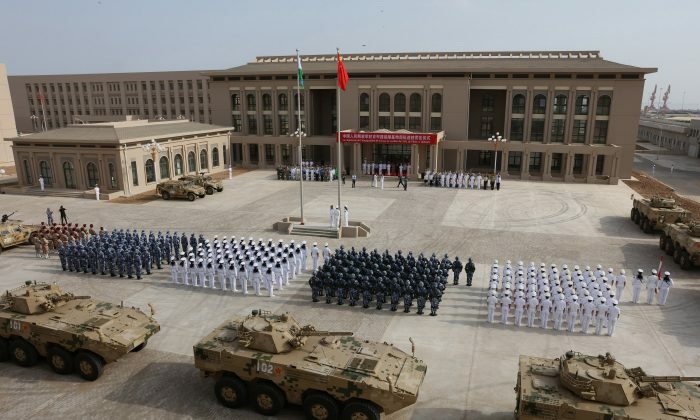 China is rapidly expanding its military base in Djibouti, a small African country on the Red Sea, according to a recent analysis by a retired Indian Army officer published in The Print, an Indian news outlet. These ships have “blue-water capability,” which means the ability to operate far from a home port and in open water. 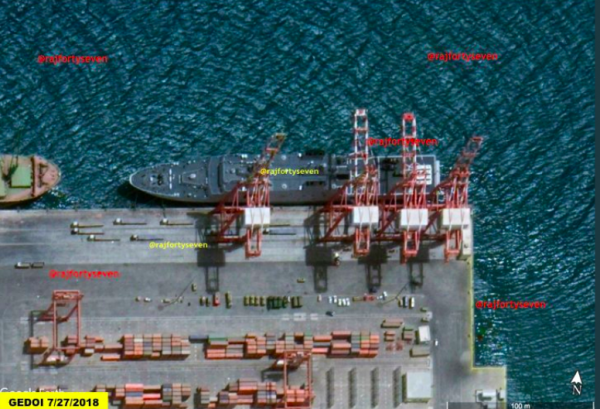 Satellite images showed that on July 27, a Type 71 LPD docked near the Chinese base in Djibouti and unloaded vehicles that were likely armored vehicles and “fire support systems,” according to the analysis by retired Col. Vinayak Bhat. After July 27, the images showed a number of large containers, which Bhat surmises were delivered by the LPD that docked near the base. Earlier in May, Bhat also discovered that a naval pier was being built. Judging by recent images, he wrote that the length was increased to more than 600 meters (about 1,970 feet), with its tip expanding eastward. “This naval pier would be able to support major repairs, replenishment, and resupply of PLAN [People’s Liberation Army Navy] ships moving in and out of the base,” Bhat wrote. This is the latest evidence that China is amping up its military presence in Djibouti, a country located at the southern entrance to the Red Sea, the southern gateway to the Suez Canal. China also has sought commercial ties with Djibouti, chiefly through financing infrastructure projects in the country, including the Doraleh Multipurpose Port, and establishing a free-trade zone. The port was completed in May 2017, financed by China Merchants Ports Holdings, a state-owned firm that was also behind the construction of the Hambantota port in Sri Lanka. In December 2017, Sri Lanka announced that it was unable to repay its loans from China and would instead convert the $1.4 billion debt into equity: a 99-year lease that handed over ownership to China. A similar fate in Djibouti is of particular concern to the United States, which considers its presence in the region critical; 4,000 military personnel are stationed at a base that serves as a launching pad for operations in Yemen and Somalia. Earlier this year in March, U.S. officials expressed their worries about China’s increasing role in Djibouti at a congressional hearing. In February, Djibouti prematurely ended a contract with Dubai’s port operator DP World, to run the Doraleh Container Terminal (different than the China-financed port). The port seizure led Marine Gen. Thomas Waldhauser, the top U.S. military commander overseeing troops in Africa, to worry that Djibouti may hand over control of the terminal to China—to which the African nation owes a significant debt. More than 80 percent of the country’s foreign debt is owed to China, according to a March report by the U.S. think tank Center for Global Development. Meanwhile, the country’s crippling public debt is valued at about 88 percent of the country’s overall $1.72 billion GDP. Waldhauser said that if the Chinese were to seize control of the port and place restrictions on its use, it could affect resupplying of the U.S. base in Djibouti and the ability of Navy ships to refuel there. Djibouti officials have denied this possibility. “There is no China option and no secret plans for the Doraleh Container Terminal,” Djibouti inspector general Hassan Issa Sultan told Reuters at the time. The latest turn came on Sept. 10, when the government announced that it would nationalize shares held by a Djibouti company that owns a majority stake in the Doraleh Container Terminal, effectively taking control. It is unclear whether the government would feel pressured to hand over control to China in the future, but the possibility has left many concerned. DP World, meanwhile, has called Djibouti’s decision in February an illegal seizure and has brought the case before an international arbitration court.